Refurbished historic miners cottage located on beachfront. This cosy cottage is nestled amidst spectacular sea and mountain views. It is located 30kms North of Westport; close to the Old Ghost Road and Denniston cycling tracks, the Charming Creek Walkway and the historic mining sites of Millerton and Denniston. Lovers Rock Cottage is within walking distance of Granity village, pubs, cafes, art and pottery galleries, library and local amenities. Activities in the area include magnificent cycling tracks, beach, river and mountain walks, tramping, fishing, whitebaiting... and more. 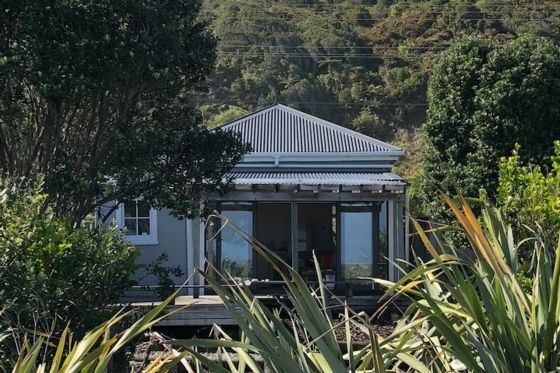 A perfect place to explore the spectacular northern Buller scenic route to the Mokihinui River and Karamea, or........ just put your feet up and soak in the relaxing ambiance of the cottage and its environs. Raised deck and unfenced property - may not be suitable for small children. Located in quaint and quirky seaside village with cafes, art, crafts, and local amenities. Lovely place to stay for a couple of Aussies who were looking to avoid the regular tourist route. We loved seeing and hearing the surf crashing on the rocks out the front and we got experience it with the rain too - all a beautiful experience. The bach or shack as we Australians say was lovely and clean with quite modern amenities keeping in mind it is a Bach which we knew before we rented. Special mention to the owner and her caretaker for the linen as being from Australia we hadn’t thought we would need it but Anene organised it for us for a fee which was so much appreciated. Yes as mentioned before be reviewers the floor slopes but it doesn’t matter, the shower was lovely and the new double glazed windows and doors were beautiful. It as freshly painted soooo nice! Thankyou for the experience. Amazing wee rustic bach in the beautiful quaint Granity. My husband and I headed over to the west coast from Christchurch to do the Buller Marathon. Only 20 minutes from Westport and a very scenic beautiful drive. Bach has everything you need. Lovely lounge with French doors leading out to a large deck. Plenty of hot water - nice shower! We enjoyed our stay would stay here again. Thank you. A slice of paradise. We will be back soon. Ideal if you want beachfront and access to Westport and Karamea. The facilities were adequate-after all this is a very old cottage. The facilities were adequate-after all this is a very old cottage. The shower was an issue as it had no shower curtain so we had to mop the floor. There was no water on arrival so had to ring the support person. The right rear element on the stove was faulty and dangerous! The instructions for the gas/hot water were not really clear. Some magazines and games would be handy. Having to bring your own loo paper is a bit rich. Other minor issues were passed onto support person. Cleanliness average.